"LSQ" stands for "Live Show Quality". That means it is good quality; good enough to be competitive at a live model horse show. It is no guarantee that you will win your class. All my tack is LSQ unless otherwise stated. "PSQ" stands for "Photo Show Quality". That means it is not quite good enough to be competitive at a live model horse show, but it is good enough to be competitive in a model horse photo show. There may be some damage or something wrong with one side but not the other, or the details may look good on film but not so good close up in person. It may still be very nice tack, but it should not be as expensive as LSQ tack. What is "Play Quality" tack? "Play Quality" tack is tack that is made more durable than show quality tack, and is meant to be played with, and not meant to be shown. It will not be competitive in either live model horse shows or model horse photo shows. It will probably be made of thicker or synthetic materials, and will not necessarily be to scale, and may not be accurate in how it is put on or attached compared with real horse tack or show quality tack. It will be much less expensive than show quality tack, yet it will be more durable and can still be a lot of fun. Tack made by Breyer/Reeves International is Play Quality tack. How do I place an order for custom tack? First, decide what you want. For example, a really cool Jumper tack set. Since everyone has a different idea of what a complete "set" is, I have moset items grouped by type on separate pages, so you can just keep adding items until you have your "set". You would want to order your saddle from the Hunter/Jumper saddle page, but you will still need to order pads, girths, bridles, martingales, boots, etc. There is a page for bridles, a page for girths, a page for pads, a page for martingales and breast collars, and a page for boots. So then you'd go to the appropriate section, and make sure you fill out all the boxes, pull down menus, etc. with all your color and pattern choices, sizes, and be sure to tell me what horse you want me to fit the tack to! Be specific - tell me you want it to fit the "Breyer Traditional Totilas mold". Just saying "Traditional scale resin" is not specific enough. You don't have to give the exact name of your horse, so long as you give me the general name of the mold it's on, like "PAS" for "Proud Arabian Stallion" is sufficient. If it has been customized with a different mane and tail, I may need to know that in case it affects the fit of the tack. Once you've chosen your items and clicked the "add to cart" or "buy now" button. You may need to click "continue shopping" if you find yourself viewing your paypal shopping cart. Make sure you have ordered everything you need, like girths and pads to go with your saddles, bridles, martingales, breast plates, etc. then put in your zip code in the Paypal shopping cart to calculate shipping charges. If it doesn't seem right, don't worry, you can send me an email and I will see if I can figure out what it should be or what went wrong and I'll get back to you asap, and maybe I can just send you an invoice if that's easier. If your shopping cart looks right to you, go ahead and place your order. You will be asked to pay for your order. You can use your paypal account, bank account, or credit card - or you cah choose to use Paypal Credit to complete your order. You do NOT need to have a paypal account to complete your order, you can just pay with your credit card. They will ask you to open an account, but it is not required. Paypal will notify me of your order and choices and I will confirm receipt of your order within 24 hours, and let you know that I understand everything. I may ask if you've forgotton something, like a girth, pad, etc. if I notice, just to be sure. I'll also give you a time frame when I expect to be finished working on your items. When it's done, I'll send you an email with a link to photos of the completed tack, for your approval. You should look carefully at the photos to make sure it looks like what you wanted. If I've missed something, let me know via email, and I'll fix it and send you revised pics. If it's all good, let me know and I'll ship it right out to you via USPS priority mail, and you should have it within 1-3 days. Why do you need to know what horse I want to use the tack on? Because they vary greatly in size and shape, and tack will not fit all horses, even if they are the same scale. They vary even more than real horses, because they have molded plastic manes and forelocks that can get in the way, preventing correct tack fit. Some models are just not "tack friendly" at all, but can wear special tack with custom cut outs to go around molded plastic manes. They will be held in place on your model with tacky wax, to appear to disappear under the mane or forelock. The Breyer "Esprit" is one example: his big mane and forelock prevent the crown of a bridle from going over the back of his head. However, he can have a small part of the crown removed, and stuck on with wax to appear to go under the hair, and then he looks lovely in tack. Also, forehead width varies a great deal, and brow bands that stick up or are too small and pull the crown over the ear bases are unsightly and won't win you any shows. They should be made specifically for each horse. Is there a difference between a square quilted pad for a jumping saddle and one for a dressage saddle? Yes, there is! A square quilted pad for a jumping saddle is rounded and more forward in the front, yet squared off in back. The sides are also shorter like the shorter flaps of a jumping saddle. The dressage pad is more square in front, and the sides hang longer, like the straight, long flaps of a dressage saddle. Does it matter what color saddle I order? Sometimes, yes. If you are planning to show your tack, it is expected that you will choose "traditional" colors to more accurately depict the type of riding you are showing for your class. For example, black is typically reserved for dressage saddles. Although brown dressage saddles do exist, they are rare and not traditional and so therefore should pin lower than a more "correct" black dressaage saddle. Jumping or forward seat saddles are typically brown, and can be any of the browns. If you are showing jumping tack on a grey horse and think black would look better, I recommend that you order a very dark brown that will have the visual effect of black, while still being technically correct. You can just make a note in the "comments" field when ordering that it is for a grey horse and needs to look almost black. Saddle seat saddles can be any color you wish, brown or black. Western tack can have many colors as well as colorful inlays, and painted areas. I don't see the color I want, Can I order in two-tone? Yes, you can order a two tone color combination. I can also mix a custom dye color for you if you want something different than shown. It may help if you have a pic you can show me of what you have in mind. Why doesn't my saddle lie flat and look like the picture? My English saddles are made on thin, flexible aluminum trees, and I have to flatten them out a bit for shippig. The saddles in the pics I've sent you have been banded. I recommend banding your saddle to your horse before each show. When you band your saddle, you bring it back into the correct position and shape. Here are complete instructions for banding a saddle. What is "banding a saddle"? Will tack stain and ruin my horse's paint? To be honest, maybe. If left on your horse more than a few days. Also, environmental variable such as humidity and sun can cause the leather dye to ooze from the leather and possibly stain your model. It's not a given though. Sometimes you can leave tack on a horse for years, and have no staining or any damage at all. It seems that lighter color horses are more susceptible to staining than darker ones. Also, custom painted horses seem to be more susceptible to staining than factory OF models, but not alway. Certain sealer coats draw and absorb the leather dye more than others. I do not know which kinds do or don't react with leather dyes. There is a lot of variation in the thickness, type, and quality of paint sealer coatings on model horses, even within just the Breyer factory Original Finish models over the years. But don't worry or be discouraged! There are some precautions you can take to prevent this. Don't leave your tack on your model for more than a day or two. Use pads and liners where ever possible. Have your tack lined with material, fleece, or undyed leather where it contacts the horse's paint. Keep a tacked up horse in a controlled environment - avoid excessive humidity and heat. I use an acrylic based leather sealer to coat my leather tack items after they are dyed and dried to help prevent staining. Yet it is a possibility you should be aware of, as I can't prevent staining entirely, I can only make it less likely. I want to order a double bridle, but I don't know how they work. Help? Double bridles can be tricky to put on. If you have never tacked up a real live horse and are a beginner at performace model showing, I suggest you start with an easier bridle, like a hunter type, or loose ring snaffle bridle. If you are good with tack and are eager to learn, patient and have dexterous little fingers (LOL), double bridles are pretty cool. Here are instructions on how to put on a double bridle. How long does your tack last? That can depend on a several variables. Under ideal circumstances, I'd say it could hold up for a century or so, until the leather dried out and cracked. In general, with saddles, it's the billets that would be the weakest point. So, if you are using slip style buckles, the "holes" in the billets need only be decorative and don't have to go all the way through the leather, so leave the most strength of the billet strap in tact, and therefore will last a very long time. If you prefer tongue buckles, which require a hole to go all the way through the leather, then the billet strap is much weakened, and will not last as long, or hold up to as much strain. With that in mind, the same goes for the bridlery. Slip style buckled items will stand up to more wear and tear than the much more delicate tongue buckle items. None of my LSQ custom tack is intended for "play", it is intended for adult hobbyist use, in live model horse shows. So if you are skilled and take care with delicate items, they will obviously last much longer than if you are easily frustrated or ill-tempered and handle them roughly. Bridlery is more delicate than saddlery - smaller straps, more buckles, etc. If you are not that dexterous, I'd recommend ordering items with slip style buckles. If you are quite dexterous, patient, and want the most realistic look, I recommend ordering items with tongue buckles. As for exactly how many times you can take it on or off a horse without breaking it, that depends entirely on how good you are at doing it. I do guarantee my work, so if an item does break under normal usage, you can return the item to me and I will repair it, usually for free - you pay only shipping both ways. Stuff happens - you slip, your cat knocks it off your shelf, your 2 yr old toddler grabs it, I don't really care - it's in my own best interest if you can keep showing my tack. It's been far better advertising for me that my tack keeps winning repeatedly at shows than anything else I could buy. I can say that out of the hundreds of tack sets I've sold since 2007, only 3 have come back for minor repairs; 1 was caused by an inexperienced, impatient person pulling too hard to force it on to avoid loosening a buckle, 1 was caused by an animal, and 1 was caused by a toddler. What's the difference between a hunter saddle and a normal English saddle? A "normal English saddle" could be a saddle seat saddle, (for riding gaited horses) of which there are several styles- but in general have a flatter seat and longer, wider flaps and usually a cut back pommel to allow for wither clearance and riding in a very up right neck carriage. Or it could mean a dressage saddle, for which there are several styles, but which generally have a deeper seat and longer flap and often have exposed knee rolls and or thigh blocks. Or a forward seat jumping saddle, which can have extremely forward curving flaps, and a medium deep or flatter seat. Or a well padded cross country jumping saddle, which can have a medium or deep seat. Or a close contact jumping saddle that will have a smaller lower flap (not visible when it's on the horse) and less padding with a medium or flatter seat. Or a straighter flap for a flat showing equitation saddle, I could go on and on. Generally, a hunter saddle, for showing a field hunter, will closely resemble or be identical to a cross country eventing saddle. I'd suggest ordering a saddle with a medium forward angle to the flap, and a medium to deep seat as that is the more modern trend in style for showing a hunter. Most hunter saddles have extra Ds on the off side, behind the flap to accommodate a sandwich pouch. (You can see the same kind of sandwich pouch pictured on the side saddle page, as ladies would join a hunt in side saddle.) Sandwich pouches are often still seen "in the field" but not so much in a show ring. Although they are not wearing the pouch, you can usually still see the extra Ds on a show ring hunter's saddle. The extra Ds have become more of an option on modern hunter saddles, however, so it's not an absolute thing. Generally, a hunter is shown in just a saddle and a mild bridle, and maybe a breast collar or pony crupper, but no training aids. A jumper, however can wear all sorts of gadgets, like a figure-8 noseband, a gag bit, running or standing martingale, boots, belly guard girth, etc. A cross country eventer will usually have a brightly colored square pad, with matching colors on boots which will match the color of the rider's protective vest, and maybe some color on the breast collar. Hunter's will have muted, or natural colors. Black is reserved for dressage, hunter and jumpers and XC want brown saddles, saddle seat saddles can be black, brown, or natural color. Can I Order Custom Jewelry? Yes! Just send me an email with your specifications, and I'll send you a quote. If you like it, I'll send you an invoice. Once you pay your invoice, I'll make your item. When I'm done, I'll send you photos for approval, to make sure I've got it right. If it's not, I'll make changes until it is. I ship as soon as I get your approval on the finished piece. If I just can't get it right, I'll be happy to give you a refund. A weymouth is a curb type bit, used on English style bridles. A weymouth curb bit has straight shanks below the mouthpiece, as opposed to a western curb bit that often has shanks that are bent over at an angle, and the shanks of a weymouth are able to slide in relation to the mouthpiece, they are not fixed to the mouthpiece. A curb bit with "S" shaped shanks is not a weymouth, but is permitted for use in dressage competition. Is a weymouth only used for Dressage? No. Weymouth bits are also used for saddle seat style riding. They can be used alone, or in combination with a loose ring snaffle called a "bradoon" on a double bridle for both upper level dressage (3rd level through FEI Grand Prix) as well as saddle seat classes. What is the difference between a dressage double bridle and a saddle seat double bridle? They are both sometimes called "weymouth" double bridles, if the curb bit on each is of English style, and both have straight shanks, and the shanks are not fixed to the mouthpiece. Both are used in combination with a small ring, loose ring snaffle called a "bradoon". The difference in the bits is that a dressage curb bit is only allowed to have shanks that measure 10cm below the mouthpiece and the shank above the mouthpiece can not be longer than the part below, while in saddle seat competition the shank can be quite a bit longer. The other differences are the style of cavesson and noseband, and browband. A dressage double bridle can have a regular noseband or a crank noseband, and can be black leather with black padding or black leather with white padding. The brow can match the noseband, or have crystal or other metal decorations, it can be in a "v" or "u" shape. A saddle seat cavesson will sometimes have a metal ring on each side, and can be either plain and flat with no decoration, or it can have a band of color across the nose. A saddleseat brow band can have a band of one or more colors, and it will usually match the noseband if the noseband is colored. What kind of buckles do you use? 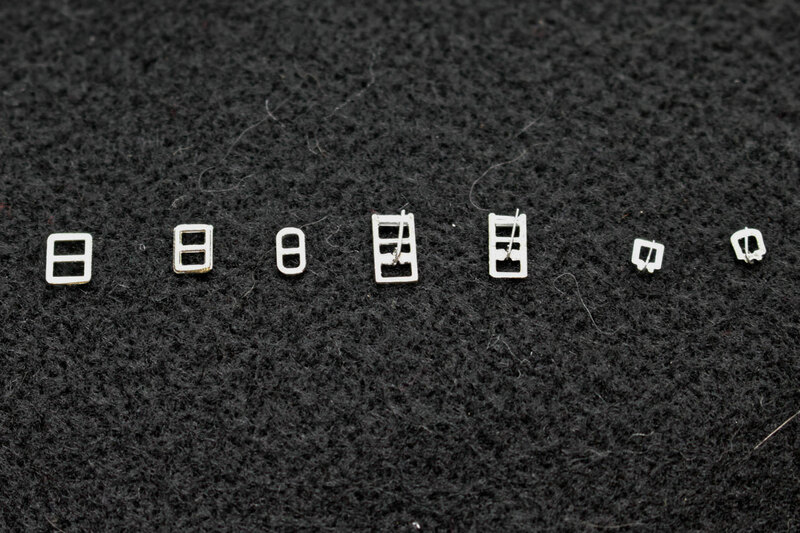 While I make and cast my own bits, I use buckles from Rio Rondo Enterprises, as they are the best quality available. Here is a photo of some of the buckles I use: Starting from the left, is the 1/8” slip style buckle (aka center bar) I use for girths, next is a 3/32” slip buckle I use for stirrup leathers. I don’t recommend making the stirrup leathers with tongue buckles as the slip buckles offer more positioning options if you use a doll, and the tongue buckles don’t show anyway - it’s a waste of time and money in my opinion. However, some people want tongue buckle stirrups anyway, so I will provide them upon request. 3rd from left is a 1/16” center bar slip buckle I use on most bridle parts, 4th is a 1/8” tongued roller buckle for girths, 5th is a 3/32” tongued roller buckle, usually for classic scale girths, followed by a square tongued 1/16” bridle buckle, and the last to the right is a 1/16” bridle buckle with tongue (aka heel bar). I also use fandy etched buckles for Western tack (not shown). Shipping is calculated based on item weight and destination. It is calculated when you checkout by PayPal's merchant service buttons based on a table of Carrier's costs. I do not add any handling or other fees, I try to have it calculated based on Carriers actual costs. I do not make money on shipping fees. Paypal's shipping calculater is fairly limited and is not always correct, but I try to get it to work as well as possible. If you are ever accidently overcharged for shipping, just send me an e-mail and I will gladly refund the difference. Yes! I ship to most countries, worldwide with the exception of Italy, Russia, North Korea, North Vietnam and any other countries that do not currently have good trade relations with the United States. If you are uncertain if I can ship to your country, please ask me before placing your order! You can use the contact page to submit your question and I'll answer you within 24 hours. Yes, I am happy to combine shipping to save money whenever possible. Unfortunately, Paypal does not make it easy. The Paypal shopping cart is programmed to charge shipping on each order you place. If you place another order before the first order has shipped, and it will fit in the box at no extra charge, I will simply refund the shipping to you from the second order. If your second order goes over a weight or size limit if packed with the first order (and the price you paid on the first order is not enough to cover it), but they can still ship together for less than two separate packages, I will pack them together for you, and give you a refund of the difference in the amount on the second order, so long as the amount is at least $2.00. I usually use the United States Postal Service. I find their rates are the best for items I sell, they have been pretty reliable on the whole. Most tack and jewelry items will be shipped in a priority mail small flat rate box. I will put in as much as will fit. Model horses will be packaged to prevent movement and damage, usually double boxed. I will offer you the choice of either USPS priority mail, or USPS first class mail package with added tracking. I will not ship without package tracking! I may require insurance on some more valuable or unique models. I do not usually insure the small tack items, as I will cover their loss or breakage myself, if the value is under $300. I may charge insurance on larger tack orders. Ido not use UPS as they charge ridiculously high rates to ship to a residence. They also charge too much to pick up, and I would have to cover my cost of driving quite a distance to drop a package off for them. I will only use UPS at your special request, after I have advised you of the added costs and you have agreed to pay them. I will not use FedEx, even if you request it, sorry. They are just too unreliable, their tracking is meaningless, in addition to being too expensive. My website uses a PayPal shopping cart, so I can accept all the usual forms of payment paypal accepts such as; e-check, paypal balance, Mastercard, Visa, Discover, and American Express. I will also accept a Money Order drawn on by the United States Postal Service. If you don't have a credit card or bank account and don't want to use PayPay, I can send you an invoice which you can pay via postal Money Order. This will obviously take much longer as I will have to wait for it to be delivered, cashed and cleared. Can I just mail you a personal check? Yes! I will accept your personal check, but it will take much longer. I will not start work until your check has arrived, been cashed and been cleared through your bank. This can take a week to arrive, then another 10 daysto clear. Sorry about this, but I've learned through experience, this is the only way to be sure I'll actually get paid. Can I call you with my credit card number? Yes, you can call me with your credit card information, and I can key it in from my end. There may be a small additional charge of 3% to do this. Yes, I now accept time payments in 2 different two ways. My website now promotes Paypal's new Buyer "Paypal Credit". The way this works is when you place an order on my website, paypal will offer you the option of using their credit services, which allows the buyer to take up to 6 months to pay off qualifying purchases. At the same time, I as the seller, get paid right away, and so there is no delay waiting for your order to ship. Paypal credit is my preferred method for time payments. I will also accept time payments on orders totaling over $200, in weekly or monthly installments, for up to 6 months. If you do not wish to use the new Paypal credit, please contact me via e-mail to work out a payment schedule. I will not ship until I receive payment in full.